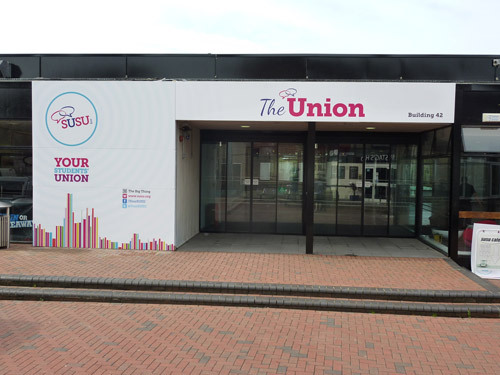 You may have heard that SUSU has been working on sprucing up The Concourse in The Union (Building 42) over the last few weeks to bring the space up to date and in line with the new Mission, Vision and Values of SUSU. On Friday 2 September 2011 the Level 4 Refurbishment was unveiled – perfectly timed for the University Open Days taking place on campus! Some of the big things that you’ll notice if you go to have a look are some new signage to reflect the new branding of SUSU to welcome visitors from outside. The reception has been moved to directly in front of the entrance to give easily accessible information to visitors, and the relocated reception now also includes The Box Office which will be open throughout the day. New additions include a huge feature wall on the right with video screens and speakers that will play exciting content such as SUSUtv or footage from key events like Your Freshers’ and Your Elections. Long-term we also hope to provide a new cashpoint and disabled toilet facilities on Level 4. With new furniture also being installed, The Concourse will become a better focal point for SUSU, providing a meeting place for students as well as somewhere for working and socialising. No Comments on "Your New Concourse"